A Vintage Domestic Chemist: My first invitation! 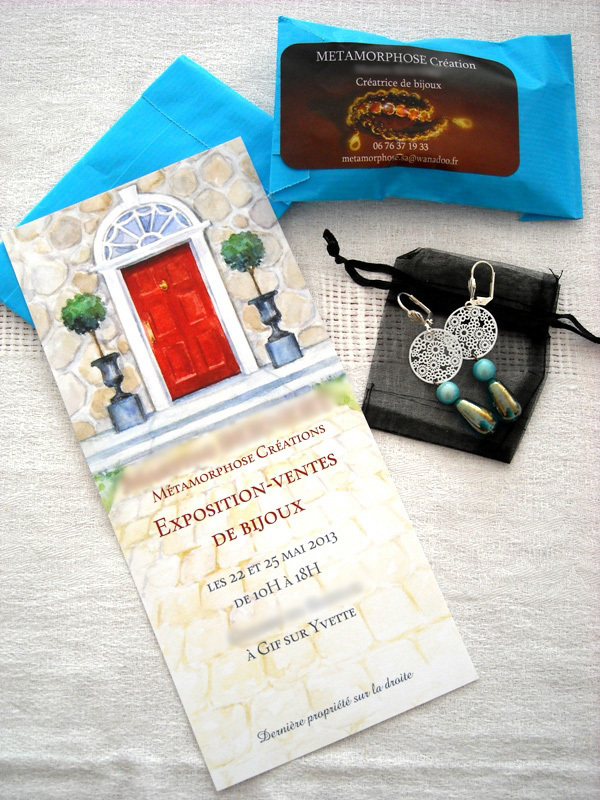 So this past weekend, I received the most wonderful thing possible to an expatriot: a personal invitation to a jewelry party in a lady's home! And true to French fashion, it was GORGEOUS! This invitation came from my English student's mother (I tutor him every week in English for his BAC-an end of high school exam). She is also in my porcelain painting class. I was honored to be given an invitation! I went and what a fun get together. I was greeted with the "bise" or the French cheek kiss upon entering and then offered mint tea and cookies. Followed by an introduction to a few other ladies as "Mme K, l’américaine". A rare breed we Americans are in France. The ladies smiled and nodded at me and then continued their conversation. While they were busy talking amongst themselves, I went and looked at my hostess' wares. She had put on exhibition all of her handiwork with jewelry. There were bracelets, necklaces, pendants, rings, brooches and earrings galore. I was awed at the beauty of it all, and she treated the mass of it like it was just some little thing she did to keep stress away and really not that impressive. She has true artistic talent. Not only did you see pearls and Swarovski crystals, but also garden hoses, slate shingles or "ardoise", and aquarium tubing used in new and funky ways for necklaces and bracelets. She said she sometimes buys a necklace or string of beads just for one pearl in the middle of it all. I bought a pair of earrings, as shown above. So summery, don't you think? And a little something else for a sweet sister of mine who will be turning 14 this summer. I can't help but feel as if I'm finally being accepted here in France. It's taken about 8 months, but the French locals are beginning to recognize me and smile back when I say hello. And I got an invitation to someone's house! When sisters come to visit!! !